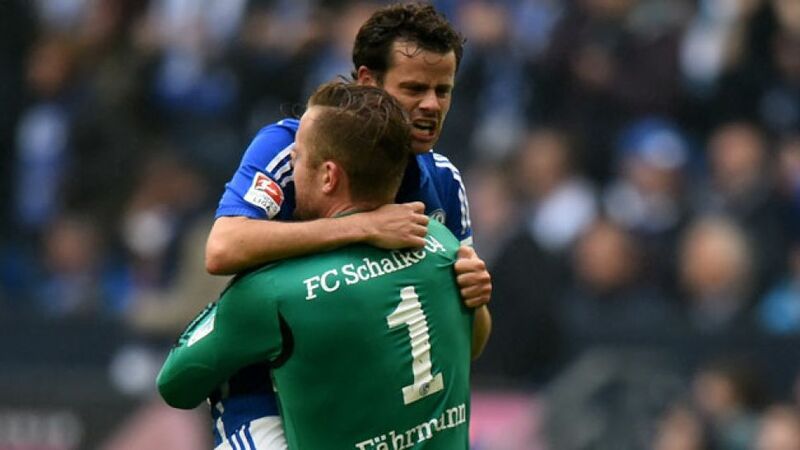 Cologne - FC Schalke 04 sealed their participation in next season's UEFA Europa League but pushed SC Paderborn 07 to the brink of the drop, while Hannover 96 secured a much-needed first league win since December on a day of drama on Matchday 33. SC Paderborn 07 conceded a minute from time to slip bottom of the table after a 1-0 loss at FC Schalke 04. Both sides went into this game with plenty to play for, with Schalke on course for a UEFA Europa League spot, and Paderborn battling against the drop. The first half was one to forget, however, with defences on top and chances few and far between. The attrition persisted after the break, with Schalke, despite a host of talent on the pitch, unable to create any meaningful chances. Their relief finally came in the 89th minute when Hünemeier bundled home an own goal from close range to effectively seal Schalke’s place in Europe next season and push Paderborn a step closer to the drop. Hannover 96 moved out of the relegation zone courtesy of a priceless 2-1 win away to FC Augsburg. Chasing a first league win since 16 December 2014, the Reds were rewarded for their bold start in the 24th minute. Jimmy Briand collected Hiroshi Kiyotake’s fine pass and in turn fed Stindl, who calmly stuck away his ninth of the campaign. The lead lasted just six minutes, though, as Verhaegh hammered home from the penalty spot after Sakai was adjudged to have fouled Abdul Rahman Baba. Undeterred, Hannover restored their advantage early in the second half when Stindl rounded off great bit of play from Briand for 2-1. Augsburg were given a lifeline when Sakai collected his second booking of the afternoon, but after Ron-Robert Zieler denied Sascha Mölders the home side’s frustrations got the better of them. Verhaegh saw red for a second-bookable offence, with Bobadilla following suit for a push on Miiko Albornoz. Hannover will definitely be safe if they beat SC Freiburg next weekend, while Augsburg need a point from their trip to Borussia Mönchengladbach to secure a place in the UEFA Europa League. Hertha Berlin moved a step closer to securing their top-flight status after drawing 0-0 at home to Eintracht Frankfurt. The Ivorian international missed an even better opportunity to give Hertha the lead after the restart. Having capitalised on a mistake by Eintracht defender Aleksandar Ignjovski, Kalou attempted to lift the ball over the advancing Trapp from the edge of the area, but he failed to get enough lift on his strike and the Frankfurt custodian was able to smother the shot. The point lifts Frankfurt above 1. FC Köln into eleventh place, while only a defeat by two or more goals at TSG 1899 Hoffenheim on the final day of the season would put Hertha at risk of dropping into Bundesliga 2. 1. FSV Mainz 05 secured their top-flight status for next season with a 2-0 win over 1. FC Köln at the Coface Arena. Ja-Cheol Koo and Jairo Samperio netted the goals for Markus Schmidt's men to take them a point ahead of their rivals, who sealed their top-flight status a week ago and for whom it was ultimately a painless defeat. The pre-match predictions may have been for a goalless draw between two sides with little left to play for this season, but the high entertainment value soon disproved that theory. Shinji Okazaki sent in the first effort on goal midway through the second half before Yuya Osako saw a goal ruled out for offside, going close again just before the interval. Koo struck the opener early in the second half with a goal that was made in Asia. Joo-Ho Park's long ball was headed down by Okazaki for the South Korean to drill in and break the deadlock. Okazaki wasted a chance to double the hosts' lead shortly afterwards while the guests had a string of chances before Jairo put the game beyond them, converting after Thomas Kessler parried the ball out.